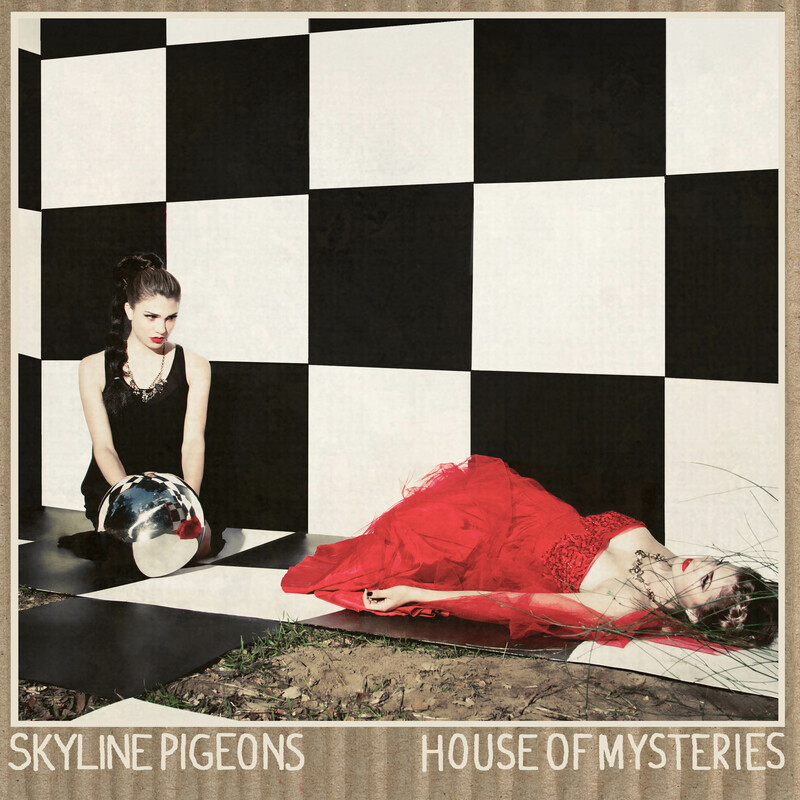 Skyline Pigeons is one of my favorite new bands. Centered on intelligent, strong and talented sisters Roxanne and Caroline Teti, Skyline Pigeons erupts with an edgy emotionalism and rich tapestry of melodies and instrumentation. The band’s debut album House of Mysteries came out earlier this month. I recently interviewed Roxanne via email. Amy Steele: Thank you for taking the time to answer some questions. I love Skyline Pigeons. The breathy, sultry vocals mixed and darker melodies on some songs and then more emotional, harder vocalizations with churning, stronger chords on others is fantastic. It’s layered, intense and wonderful. Roxanne Teti: Thanks for your kind words and interest. It means a lot to us. Amy Steele: When did you first become interested in music and when did you decide to form a band and really pursue writing and recording music? Roxanne Teti: We are classically trained musicians and so we’ve been playing music since we were five years old. As we approached teenage adolescence we started writing songs together and really exploring original creativity. I think it happened about four years ago, while I (Roxanne) was a freshman in college and Caroline was a freshman in high school when we really started to take our musical and lyrical collaboration seriously. I think the desire for this was feeling the need to want to communicate our personal emotions and concerns about society through song and then finally gathering the courage to do it. Amy Steele: How long have you been in music? Did you study music or learn on your own? Roxanne Teti: Caroline has played piano since she was five years old and continues to teach herself new additions to the instrument by learning organ, analog synthesizers, and different electronic keyboards. She also is teaching herself how to play guitar now and is really into slide guitar and alternate tunings. Growing up I began with piano but then switched to flute. I played flute for about 13 years. About five years ago I picked up the guitar and the harmonica, and taught myself how to play. My main inspirations to learn guitar were Bob Dylan, Leonard Cohen, Ani Difranco, PJ Harvey, and Johnny Cash. Amy Steele: So sorry to hear about the fire and destruction of your house. Had you already started writing songs or was that even an impetus to writing these songs? Roxanne Teti: We were always writing songs before the fire and so the fire acted as sort of catalyst in really forcing us to sit down and record a full record. Yes, many of these songs are directly inspired by the traumatic experience, but songwriting was our rock before and especially during the fire. It became the one thing in our lives (at that moment) that didn’t “change.” In effect, it became a part of our lives we place more value on. Amy Steele: What is your writing process? Roxanne Teti: Caroline and I write songs together as a collaborative unit. We usually guide each other in nailing a melody or following a song’s arrangement to finish. We usually write together or sometimes work on songs individually and then show them to each other and then continue writing more. Most of the time we are pretty open to each other’s ideas but when things are super personal, it’s kind of like okay, we won’t touch it. Amy Steele: Where do song ideas come from? Roxanne Teti: We draw from personal inspiration in our romantic lives as well as social issues that involve realities around us. I studied sociology and so I’m also thinking about other people’s realities as well as my own and often look for inspiration in dire places like the news or just by looking out my window. Most of the time, ideas take flight from a current emotion or following a moment to where it satisfies. Honesty is also a big part of inspiration—as recognizing truth and communicating that truth is difficult to do but incredibly gratifying to sing about if done appropriately and without regret. Amy Steele: As sisters what are the challenges of working together? Roxanne Teti: We are siblings and so we definitely know how to push each other’s buttons if we want to. But importantly we want to write good music together and have fun doing it and so confrontation like that rarely comes up. I think some of the challenges can come up in debating over a song and its stylistic direction but what is so great about being sisters is we usually have similar taste on issues but when differences of opinion do come up the differences add more dimension and complexity to the tune. Amy Steele: How do you support one another? Roxanne Teti: We always have each other’s back and always put our relationship in front of the music. In that sense we keep each other calm, focused, and happy. We try to provide a calm setting emotionally for whenever life gets stressful. Caroline and I are both finishing up college right now. Caroline is an undergraduate majoring in classics at UCLA and I’m a graduate student in film school at USC and so we try to accommodate each other’s schedules and create less stress for when we have to tour or record a song. Amy Steele: Why do you think there still are not that many female-fronted bands or all-female bands? Amy Steele: One hears many eclectic sounds and emotional range in your beautiful music. What influences you? Roxanne Teti: We are very much influenced by memories and the recognition of capturing a moment through song. We tend to write most freely when we let the creative juices flow like a stream of consciousness without placing any boundaries on the song’s structure or lyrical content. We like recording these processes and labeling them with dates and times just as one would do with items of nostalgia. This also helps us try and remember what we’ve written while in a transcendental mindset that lacks hesitation and promotes a “sonic libido” or a notion that feels gratifying to the senses. In terms of style and vibe I feel like we are mostly influenced by the harmonies and melodies of the late 50’s and early 60’s and psychedelic rock and folk music. We’re inspired by the cultural consciousness and atmospheric projections of Bob Dylan, The Doors, The Velvet Underground, Elton John, and Leonard Cohen. The way Leonard Cohen grasps and chills an audience with such undying resolution and delivery is so consuming and inspiring. Mazzy Star, PJ Harvey, and Cat Power are more contemporary groups/songwriters we have grown up listening to as budding songwriters and have been influenced by their husky reverb meshed voices, instrumental choices, and simplistic and atmospheric musical arrangements. Amy Steele: What do you like best about this album? Roxanne Teti: We like how everyone song is different but is still somehow unified by our sound. Amy Steele: Why did you name the band Skyline Pigeons? Roxanne Teti: We are huge Elton John fans and the band name came to us while listening to Elton John’s first record Empty Sky (1969). There was a harpsichord version of the song on the record called Skyline Pigeon. The song is one of Elton and Bernie Taupin’s first really beautiful lyrical and musical collaborations. This collaboration reminded us of the way Caroline and I work together as songwriters and so came the band name—The Skyline Pigeons. Amy Steele: Thanks! Hope to see you in Boston soon. This entry was posted on June 30, 2012, 19:38 and is filed under Interview, Music. You can follow any responses to this entry through RSS 2.0. Both comments and pings are currently closed.